Last edited by MadZuri on Wed Apr 01, 2015 6:48 pm, edited 1 time in total. and also a closer look. 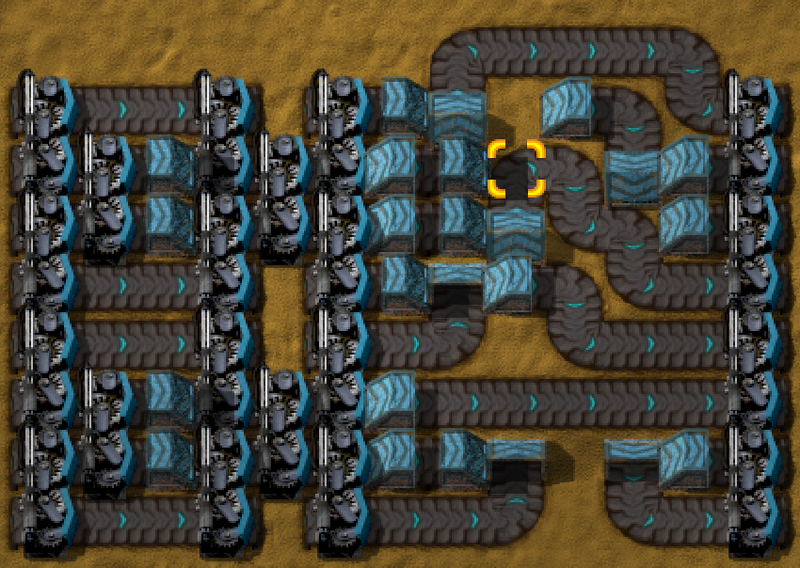 Those fast belts limit edge throughput and forces items into center. Last edited by MadZuri on Tue Mar 10, 2015 9:09 pm, edited 1 time in total. Last edited by MadZuri on Wed Apr 22, 2015 12:49 pm, edited 2 times in total. 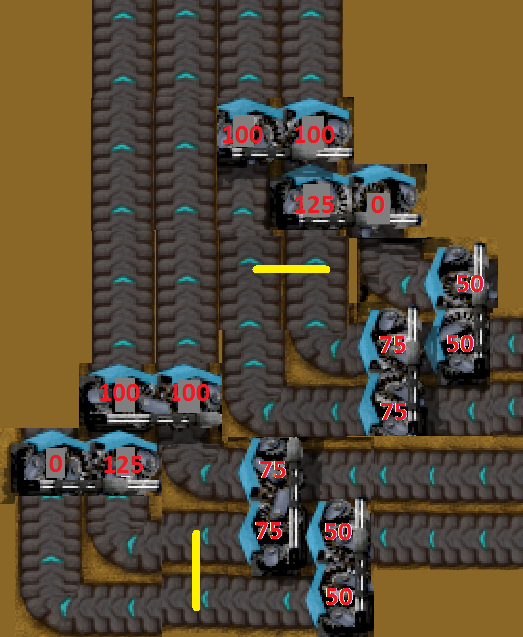 Also, I feel like the last one could be improved with underground belts to make it more compact but MS Paint is hard enough already. And lastly, I would have to guess a design that doesn't have a single percentage over 100 would be the best result because technically anything over 100% is actually just causing a small back log so although you have 100% compression it is a result of backing up the throughput at that specific point to force compression to be full again.. but I guess the corners are losing some compression.. so you do need a bit over 100.. if someone could figure out the exact number you are losing aka the compression percentage after a belt turn then you could tweak the design again to fully optimize the throughput. I do not work on any of this in-game but enjoy reading these discussions on the forums. Your fractions are off on your math. 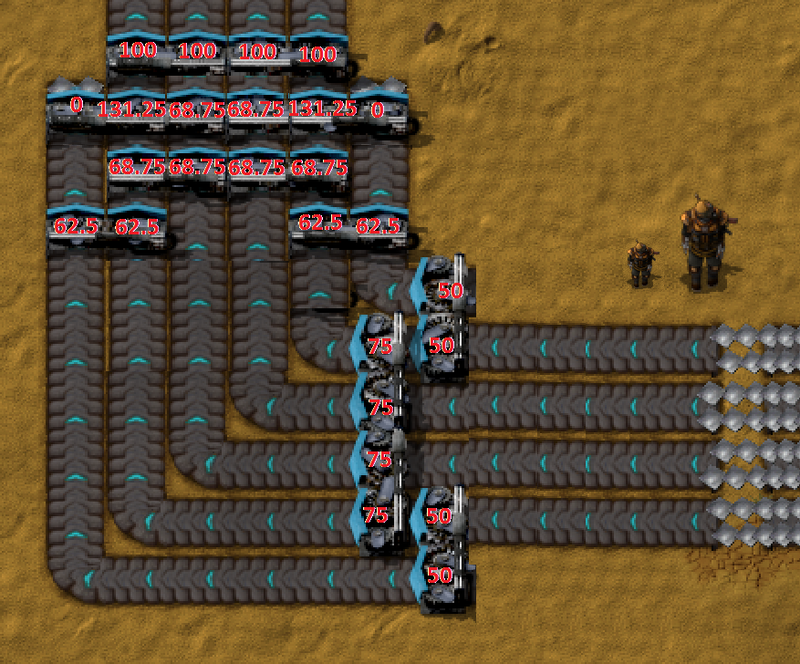 You're putting 2 different numbers for the 2 outputs of some splitters. Just add the 2 inputs and split them evenly. Also, compression loss is ~33% on corners, so anything above ~67% will hang up. The max output/input of any one side of the splitter is 100%, but back-calculating the uneven split is difficult. Your first one worked surprisingly well, only minor delays occasionally. The compression loss on the corners forces the entry splitters to force more out to the wings, decreasing the number of entry splitters required. 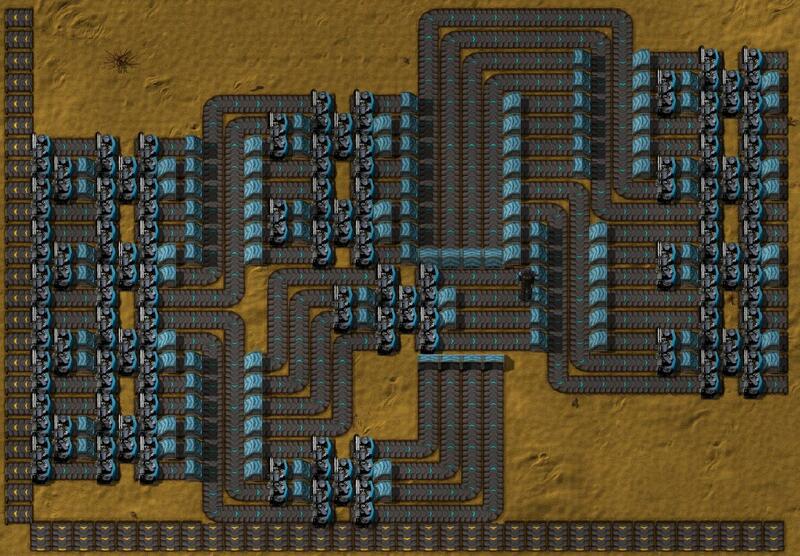 I over-engineered that, and got the numbers to almost exactly 67% on all 6 lines that turn. I suppose that wasn't necessary, and you used basically the same exit that I did. Good job. It relies heavily on that back-pressure mechanic, and works at about 95% throughput. I believe madzuri's design from last night would work best. The left is where the ore will attempt to go and the right is where I believe ore will go with corner bottlenecks in the center. Definitely. It adds also a new type of game-play, cause you have to handle the empty boxes. At first I didn't think that the combiner would work if I just literally put the splitter in reverse. After designing an entirely too complicated merger system, I tried it, and it works magnificently. There is a slight change, but I was surprised it worked. And yes, that 4 to 12 splitter system equally divides the stream. 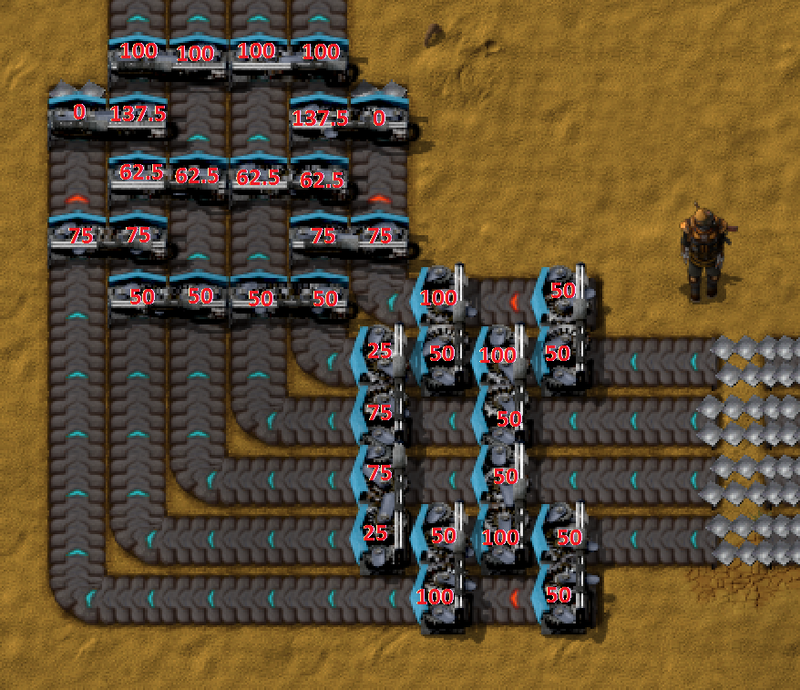 Ignore the thing to the right, don't know why I included it in the pic, just messing around with strange lossless belt designs. I can see it perfectly clearly and from that pic recreated it for use in my mega base. cheers Madzuri ! LMAO Madzuri, once again you have outdone yourself. I mean, wtf.